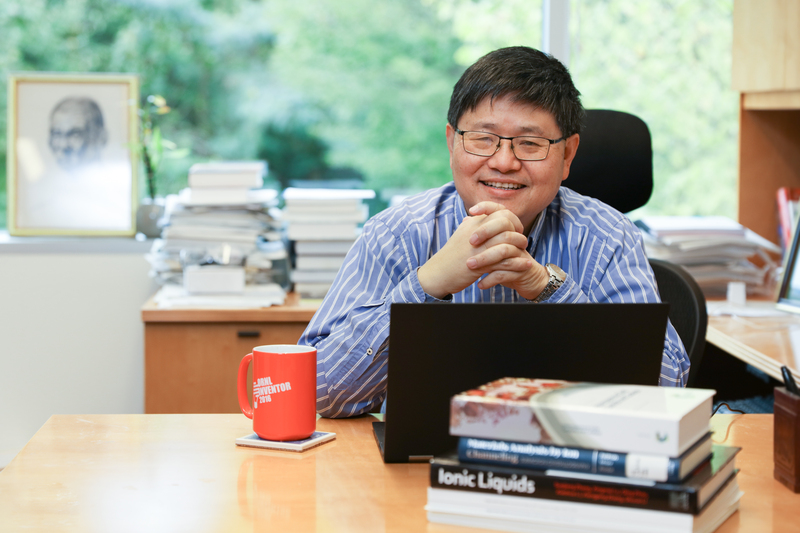 Sheng Dai innovates chemical separations, nanomaterials synthesis, and catalytic interfaces for energy applications at Oak Ridge National Laboratory, and is the lab’s most prolific author. He is a Corporate Fellow researcher, leader of the Nanomaterials Chemistry Group, and director of the DOE Fluid Interface Reactions, Structures and Transport Center based at ORNL. December 17, 2018 – Sheng Dai, the most prolific author ever at the Department of Energy’s Oak Ridge National Laboratory, had no intention of pursuing a career in science as a young man; he wanted to paint instead. But he couldn’t help noticing that the stones artists carved with their initials and used to stamp their creations often contained more than one color, and it sparked his curiosity. Today, Dai is world-renowned for innovating chemical separations, nanomaterials synthesis, and catalytic interfaces for energy applications. His more than 700 peer-reviewed publications have netted 36,677 total citations, earning an exceptional h-index (reflecting productivity and impact) of 96. He also holds a total of 51 patents. Dai is leader of the Nanomaterials Chemistry Group in the Chemical Sciences Division and a Corporate Fellow researcher at ORNL, who also holds a joint faculty appointment in the Department of Chemistry at the University of Tennessee, Knoxville. He is director of the Fluid Interface Reactions, Structures and Transport Center, or FIRST, a DOE Energy Frontier Research Center based at ORNL that focuses on an atomistic understanding of electrolytes and electron transport to advance electrical energy storage. Dai is involved in several other projects supported by DOE’s Office of Science (Basic Energy Sciences’ Separations program), largely centered on how to control molecular or ionic interactions to develop a host that can selectively recognize and separate certain substances, such as carbon dioxide. When those interactions can be controlled it can lead to higher selectively for targeted substances and enhanced transport properties of those species across a membrane or other media. It is a fundamental strategy that can apply to separations in a number of different areas, including a high-profile project funded by DOE’s Office of Nuclear Energy that created an adsorbent for the separation of uranium from seawater. ORNL researchers in that multi-institutional project developed a polymeric adsorbent material to selectively bind uranium from the ocean’s immense chemical soup. The results of the uranium/seawater project could be applied to the grand challenge of clean water—particularly desalination and the treatment of water after it is used in industrial processes such as hydraulic fracturing. “The sorbent material could be used to extract minerals or metal ions from wastewater streams,” Dai noted. While this solution tackles desalination through chemical binding, he was a key contributor to a project that tackled desalination with the help of electrochemistry. For this project, he developed mesoporous carbon for capacitive deionization electrodes—work that netted an R&D 100 Award in 2011. That particular breakthrough in mesoporous carbon materials holds great promise for applications such as the separation of carbon dioxide or the storage of energy. The associated publication, “Mesoporous carbon materials: Synthesis and modification,” appearing in Angewandte Chemie in 2008, is one of his most highly cited, with 1,138 citations total. A hallmark of Dai’s work has been participation on large, collaborative teams, and it’s a practice he hopes will continue among young scientists at the lab. Dai grew up in China, with a father who was a middle school principal and a mother who was a teacher. 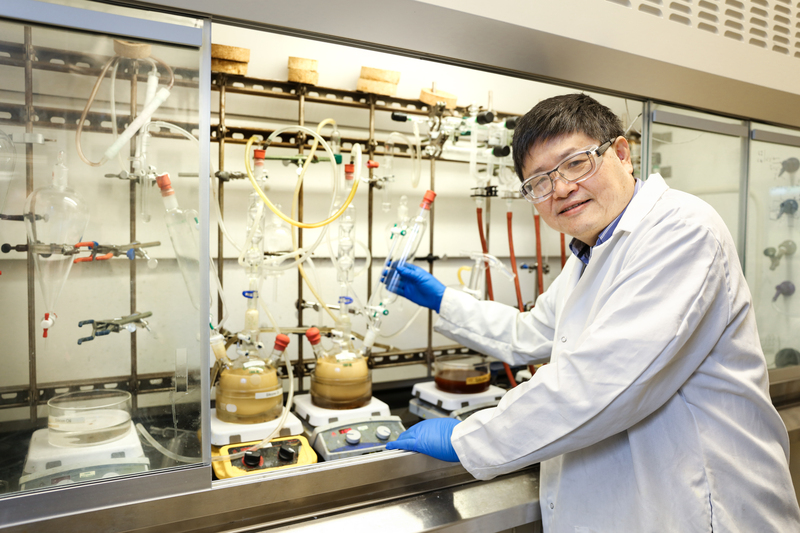 He earned his bachelor’s and master’s degrees in chemistry from Zhejiang University in Hangzhou, China, and a PhD in chemistry from the University of Tennessee. He joined ORNL in 1990 as a postdoctoral fellow, initially studying molten salts for nuclear energy applications—an area of innovation for ORNL that includes the 1960s Molten Salt Reactor Experiment, which continues to offer valuable insights. The new work is related to the use of molten salt as a heat transfer medium and for thermal energy storage in concentrated solar power projects that operate at high temperatures. Given the history of molten salt research at ORNL, “we’re not reinventing the wheel. We will leverage our previous knowledge of molten salts, and once again we’ll be trailblazers,” Dai said. Dai is also heavily involved in research around ionic liquids (salts that are liquid at room temperature) and a new class of porous materials that have the potential to open up vast opportunities in chemical separations, and in building new catalytic interfaces to create new, controlled reactions. ORNL is managed by UT-Battelle for the Department of Energy's Office of Science, the single largest supporter of basic research in the physical sciences in the United States. DOE’s Office of Science is working to address some of the most pressing challenges of our time. For more information, please visit https://science.energy.gov.